It is CREATIVE ZONE’s 5th anniversary and they plan to celebrate with all the ‘bells and whistles’. Reaching the five-year mark truly is the sweet spot for all startups and especially for those who bravely launched their business in the aftermath of the 2008 Global Financial Crisis. This is particularly significant for CREATIVE ZONE whose sole purpose is to help fellow entrepreneurs launch and grow their new businesses in the UAE. Why conduct business with a company that hasn’t already achieved exactly what you want for your own startup company? To paraphrase their Mission Statement; we not only contribute to, but are also witness to, the success of our clients’ business as it grows. CREATIVE ZONE is currently viewed as one of the leaders in the UAE business startup environment. Over the coming decade they plan to cement their authority as THE go-to expert for entrepreneurs wishing to successfully establish a company and grow market share in the region. The true indicators of CREATIVE ZONE’S success are the 3,000 plus client businesses launched in UAE since 2010 and a whopping 42% of new business originating from client referrals. To have reached this milestone in a highly competitive industry truly is a ‘big deal’ for a business startup specialist. There are vastly differing statistics the world over regarding the survival rate for business startups. Notable sources including Forbes and Bloomberg list the rate of business failure varying between 50 and 80 percent in the first two to five years. Patricia Schaefer of Business Know How states poor management, lack of passion, insufficient capital, improper planning and wrong location choice as the top contributors to business startup failures. In a 2014 Gallup Research study of 4,000 entrepreneurs in the U.S., Mexico and Germany, the number one reason for failure was that ‘the entrepreneur just didn’t have the talent for the job’. CREATIVE ZONE Managing Partners Steve Mayne and Mahesh Dalamal certainly demonstrate a talent for startup business. 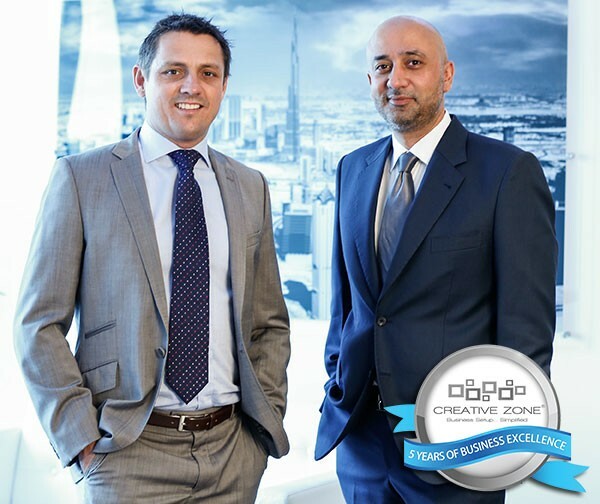 A combined fifty years of global management, business consultancy and corporate leadership experience coupled with an entrepreneurial flair has resulted in more than ten successful enterprises between the Dubai based duo. At their recent Anniversary Ball, Dalamal attributed the success of CREATIVE ZONE to a truly exceptional team combined with a strong company ethos of professionalism, honesty, transparency and client service. ‘The success of this company comes down to the incredible hard work and dedication of each of our sixty team members. I am very thankful to be surrounded by such honest and talented people, who not only excel individually but combine so well as a team - the camaraderie and loyalty they demonstrate is truly exceptional,’ Dalamal said. Mayne noted that the company culture reinforced values of loyalty, trust, motivation, dedication, respect, friendship, results and a sense of family. ‘We believe in building a strong company culture based on trust and mutual respect which, in turn, drives customer service. Our clients are the heart and soul of our business and supporting them in their success is our highest priority,’ he said. Mayne took the opportunity to announce the anticipated launch of a sophisticated online Client Referral Rewards program in late 2015, which will enhance the close working relationship between CREATIVE ZONE and their clients. ‘The continued growth of CREATIVE ZONE is a result of the loyalty and trust of our valued clients. On behalf of our entire team, thank you for the ongoing support. We look forward to continuing to work together with you in partnership, and trust that you are equally excited for the future of our businesses in the UAE. Our Referral Rewards program is a simple way of acknowledging the value of that partnership,’ Mayne concluded.